The lovely ladies at Bay Bird Inc. included me in a great media dinner at Sublime Ale House. The folks at Brewery Tours of San Diego gave us a ride up to San Marcos and owner James Limjoco and his staff proceeded to bring a deliciously endless stream of food and beer. 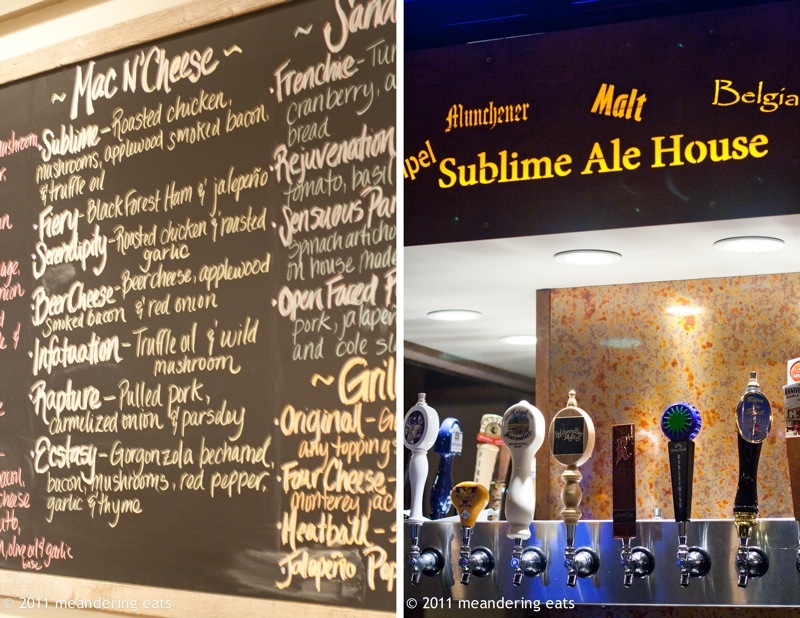 When you arrive, the first thing to do is check out their amazing beer menu. Our table was covered in tasting glasses and they were very generous with letting us taste whatever we wanted. Highlight of my night: Lost Abbey's Red Barn Ale. We started with the house fries topped with truffle oil (and not too much, which is fine with me) and Parmesan, served with a variety of aiolis for dipping. My favorites were the roasted red pepper, roasted garlic, and pesto. The fries were perfectly crisp and served in a paper cone, Belgian-style. Next up, the housemade pretzels, which were very yummy. The sauces that came with it, beer mustard and beer cheese, were ok, but that didn't matter because the pretzels were tasty enough on their own. Next came the salads, which I highly recommend, regardless of whatever you order. 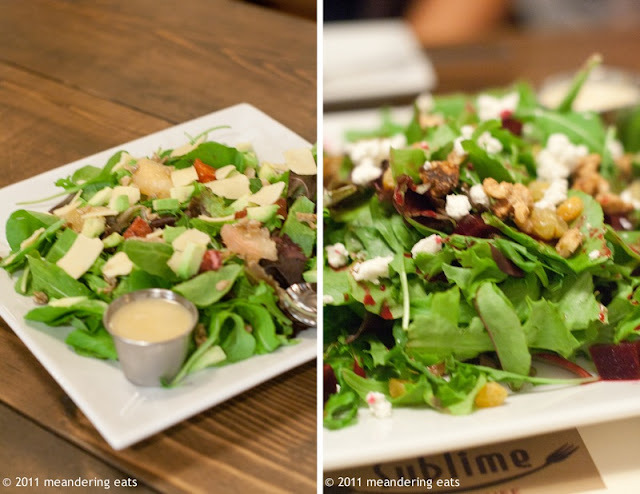 Between the beers and the heavily delicious comfort food, salad will help clear the palate and lighten things up. We tried the avocado citrus salad, with chunks of avocado, grapefruit, and blood orange. It was good, but I loved the beet salad with candied walnuts, raisins, and goat cheese more. The pizzas at Sublime have a delicious crust, which we learned that owner James has been tinkering with. The pizza pictured is the Mountain Summit, which should have been named Dan's Favorite Pizza, because it had all of his favorites on it. Wild mushroom, artisanal sausage, garlic, and caramelized onions. As for mac 'n' cheese, there's quite the selection. There's Purity for the purists and the other choices come with everything from mushrooms to bacon to chicken. Our table had two: Infatuation, which I photographed, and Purity, which I ate. 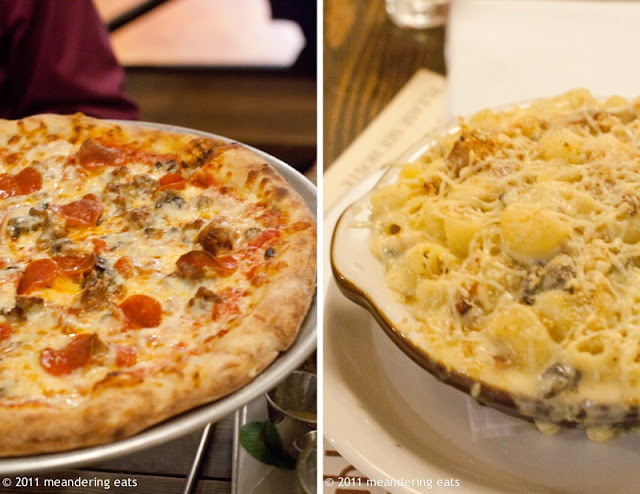 Be warned that one order of mac 'n' cheese can easily serve four, so to sample the menu thoroughly, I suggest bringing lots of friends or taking some home. 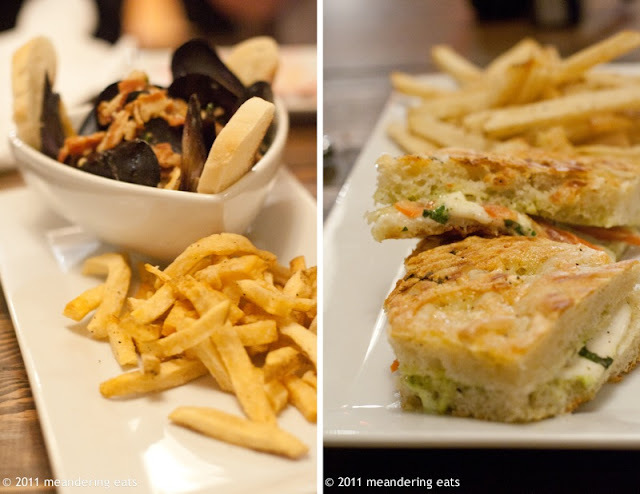 My favorite dish of the night was the beer mussels, which were topped with lots of lardons and served with fries and toasted baguette slices. 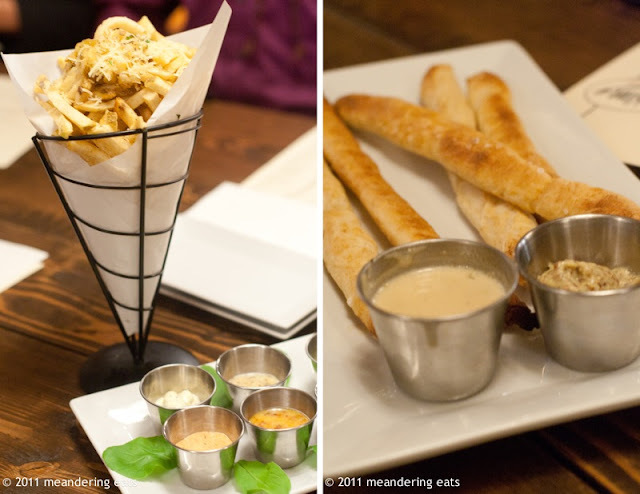 The flavors were fantastic and it went perfectly with the fries and copious amounts of beer. The burger, which was Leanne's hubby's pick, has Brie, caramelized onions, and bacon jam. If that wasn't amazing enough, James told us that they butcher their own beef, meaning the ground beef patties are made in-house and have just the right amount of fat for the perfect patty. Dessert was chocolate cake and red velvet cake. They were good, but a little lost in the richness of our meal. Between the beer and the delicious food, I don't think I had the palate for dessert. If you're in the mood for a fantastic place to sample a myriad of excellent beers, eat some hearty dishes, and hang out with friends in a restaurant with a warm and cozy ambiance, I suggest Sublime. Many thanks to Ashley, Peyton, and Natalie of Bay Bird Inc. and James and the staff of Sublime Ale House for including me in this amazing preview dinner. Although this was a dinner provided to the media by Bay Bird and Sublime, my opinions, as always, are my own. I don't usually order pasta when I dine out, but my friend insists that I need to try their macaroni and cheese. I'll be sure to keep the beer mussels in mind when I visit!